The Knight's Armament LMG Classic Edition magazine holds 1200 rounds and works only with the Knight's Armament LMG. The strong plastic construction lends itself well for durability while keeping low weight. The 1200rd capacity provides plenty of ammo for even the most suppression heavy firefights. 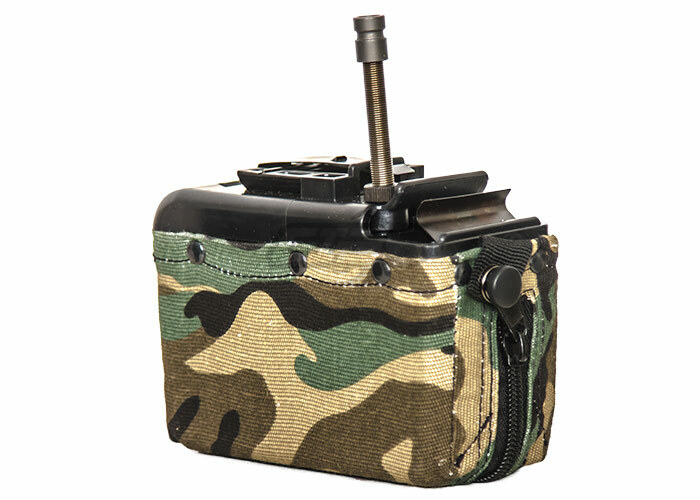 While most box magazines require the box to wind manually, this box magazine is powered by a 9 volt battery and winds automatically as long as the battery provides power. This Magazine comes with a Woodland cover. This box magazine may work with other airsoft guns but cannot be guaranteed by Airsoft GI. Will this work in either A&K or Classic Army m249?